Coloring books aren't just about Disney princesses and Dora the Explorer anymore. 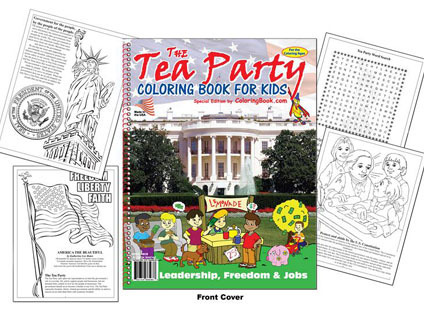 "The Tea Party Coloring Book for Kids," published by the St. Louis-based Really Big Coloring Books Inc. and sold online for around $4 at coloringbook.com, has been a big seller - and is causing a stir. Some are claiming that the book wasn't made for children at all, but for right-leaning adults, as KSDK notes. Critics say passages in the books are overly political. "When taxes are too high, the high tax takes away jobs and freedom," reads one passage. "In 1773 we had a Tea Party and this led to freedom from high taxes. Today we are having another Tea Party and this will lead to freedom from high taxes again!" According to Wayne Bell, the publisher at Really Big Coloring Books Inc. the purpose of the book is not political. "We're not really making a political statement," he told Hotsheet, noting that his company publishes books on a range of topics, including the Rockettes and Cirque de Soleil. He stressed that the book did not include direct attacks on a political party and contains historical data and information on how a bill becomes a law. He also noted that his company makes an Obama coloring book, which, like the Tea Party book, is featured on the front page of the company's website. The Tea Party book, he said, is by far the better seller, with demand so high that new books must be printed every day to keep up. "We have sold many thousands," said Bell, who penned the book. Bell, who describes himself as a "very liberal, open minded guy," denies that the Tea Party is behind the book or that any of the money from sales goes to the Tea Party movement. He said he has even received death threats over the coloring book, both in writing and over the phone. According to local St. Louis Tea Party member Bill Neukum, the book could be helpful. "It looks fine," he told KSDK. "Having the Tea Party name on it, and I guess if you're trying to tie it to the present day Tea Party movement, that's fine with me."